The structure and those who work night and Day. Very very good. Very close to CDG which helped me in catching my flight on time. 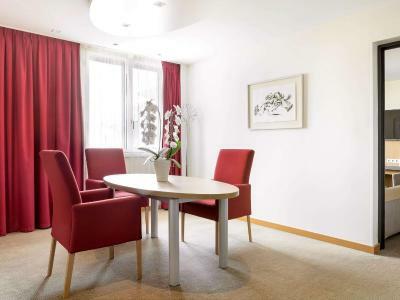 Family-friendly, clean, a good value, close to the airport! Town of Roissy-en-France was fun to explore. Perfect location to rest and recover from jet lag with an excellent restaurant and helpful staff. Nice facilities, great shuttle service very convenient. Very family friendly. Play room by the lobby was great. View from the fourth floor to see planes landing. Very good noise isolation from outside and other rooms. Convenient shuttle back and from the airport. The staff were, by and large, very friendly (the front desk clerk didn't explain anything about the hotel and took quite some time to get to us, but the rest of the staff were lovely and accommodating; a waitress at the restaurant convinced the bartender to let her have some warm milk for my daughter off the menu, for example). Comfortable bed! Very close to the airport and the shuttle was very helpful. Breakfast was amazing! Facility overall very clean and staff friendly/helpful! Also spoke English well. 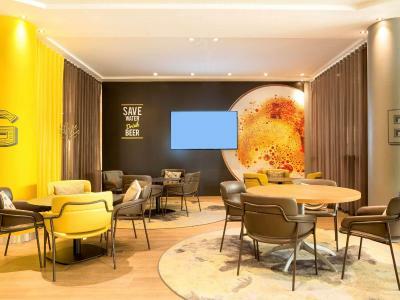 This 4-star Novotel is located 1.2 mi from Roissy Charles de Gaulle Airport and Aéroville Shopping Center. It is only a 10-minute drive from Parc des Expositions Paris Nord Villepinte Exhibition Center. Guests have free access to the spa by Carita featuring a sauna, heated indoor pool, fitness room and hammam and massages are available upon request and at an extra cost. 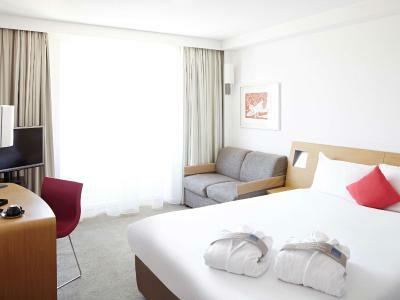 The soundproofed and air-conditioned rooms at Novotel Roissy CDG Convention & Spa are light and airy. Each room has a flat-screen TV with satellite and beIN Sport channels, a desk, a private bathroom as well as tea and coffee making facilities. Free WiFi is provided throughout the hotel and secure private parking is available on site. 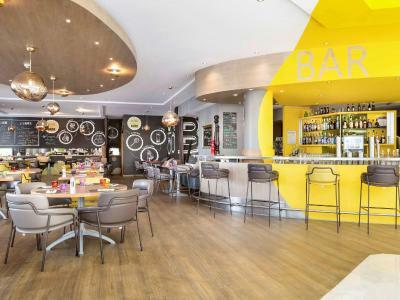 A buffet breakfast is served each morning at the Gourmet Bar, which also offers innovative, French dishes throughout the rest of the day. A 24-hour snack menu is also available, while the bar is open until midnight and features a table football. 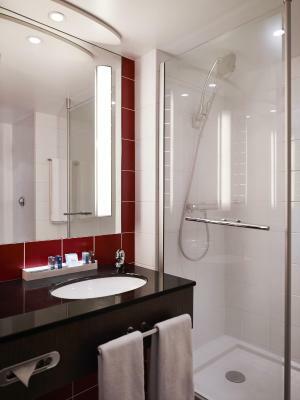 The hotel is 12 mi from Parc Astérix Theme Park and 16 mi from the center of Paris. Disneyland Paris is 25 mi away. The hotel’s shuttle (Black Line) also provides connections to the RER and TGV Train Stations. 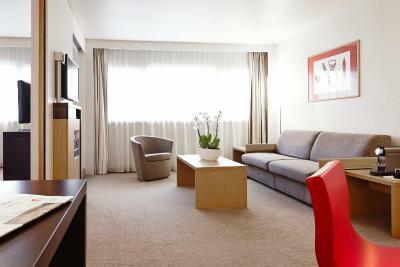 Le Bourget Airport is 6.8 mi from the Novotel Roissy CDG Convention & Spa. 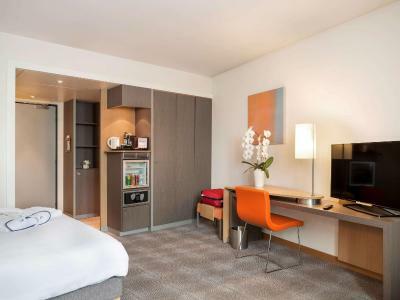 When would you like to stay at Novotel Roissy CDG Convention & Spa? 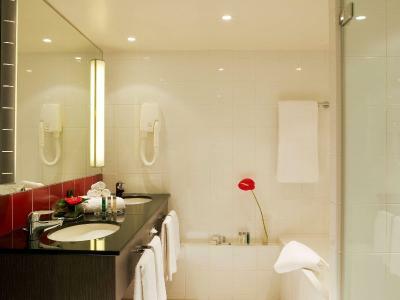 An air-conditioned room with free Wi-Fi, minibar with 2 free small bottles of water and facilities for making hot drinks. 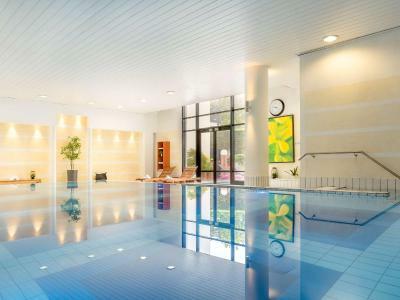 It includes access to the spa. Private parking is available on site (reservation is not needed) and costs EUR 21 per day. An air-conditioned room with free Wi-Fi, minibar with 2 free small bottles of water and facilities for making tea and coffee. It includes access to the spa. This room features free Wi-Fi, a free mini-bar with soft drinks and crisps, and a Nespresso machine for making tea and coffee. Free access to the spa, bathrobes and slippers are also provided. The suite features a living room, a free mini-bar with soft drinks and crisps, 2 bottles of water, a Nespresso machine, and free Wi-Fi. 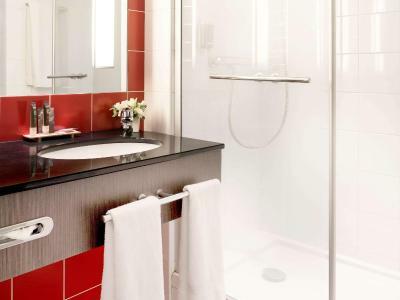 The private bathroom includes a spa bath, shower and separate toilet. This family room has air conditioning, soundproofing and mini-bar. 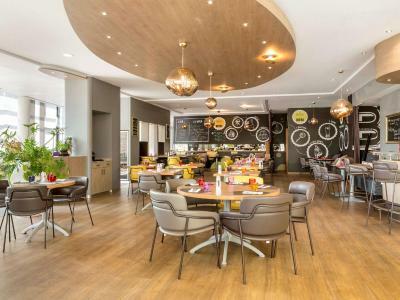 Located in the village of Roissy-en-France, 3 km from Roissy CDG International Airport, Novotel Convention & Wellness Roissy CDG enjoys excellent motorway, rail and air access facilities. 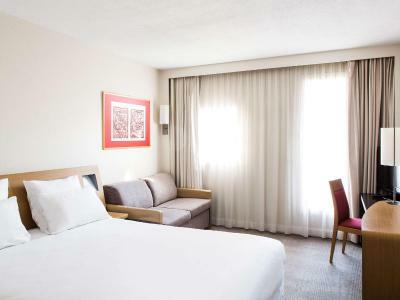 For a family vacation or getaway for two, unwind in the spacious rooms and spend quality time together in the cozy atmosphere of the restaurant and bar. 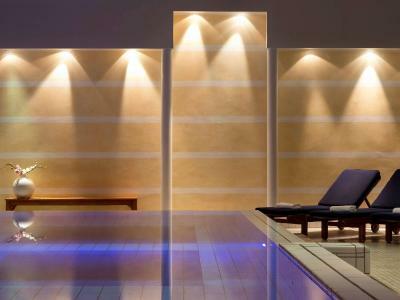 Enjoy total relaxation in the wellness area with hammam, sauna and heated indoor pool. 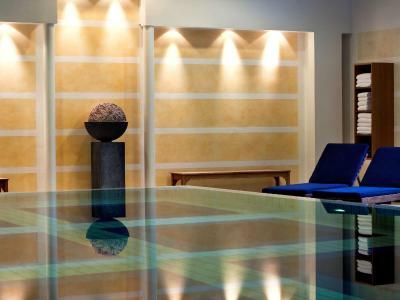 House Rules Novotel Roissy CDG Convention & Spa takes special requests – add in the next step! 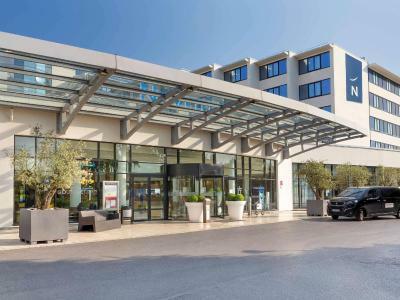 Novotel Roissy CDG Convention &amp; Spa accepts these cards and reserves the right to temporarily hold an amount prior to arrival. 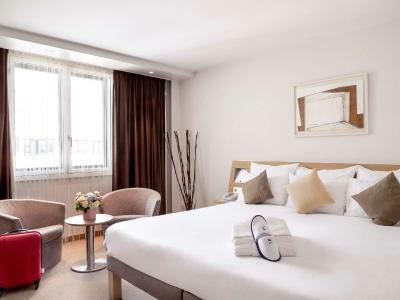 Novotel Roissy CDG Convention & Spa accepts these cards and reserves the right to temporarily hold an amount prior to arrival. 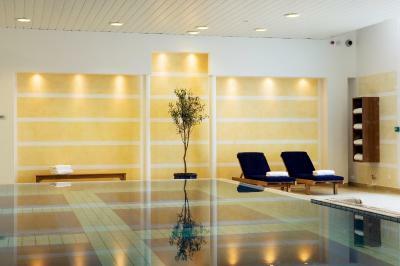 Access to the spa by Carita is free for hotel guests and treatments are available upon prior reservation. 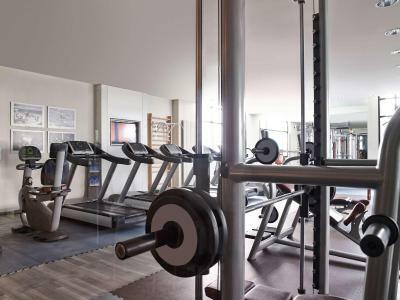 The fitness center is open from 06:00 to 23:00 every day. The free airport shuttle service (Black Line) operates every 20 to 35 minutes between 05:00 and 00:45. It stops at both TGV/RER Train Station in Terminal 2 and CDG Roissypole/RER Terminal 3. Please note that children under 16 years old can enjoy breakfast for free. Hot breakfast would have been appreciated for room service. Very helpful and friendly front of house staff Yusef especially. Bar staff extremely helpful. Facilities for children. The air conditioner was not cool enough. No hand lotion in the room. Bartender didn’t know how to make a martini. I showed him and he was sweet about it. There were no olives for the martini. 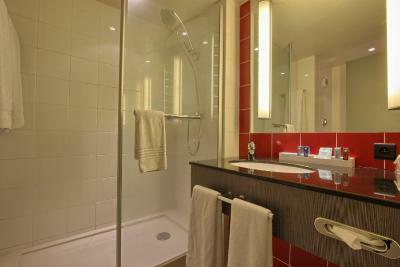 The room had a bath tub. The hotel per say was excellent, but I was disapointed by the restaurant-bar. Although the meal quality was very good (good cook), the service and waiters were completly choatic (wrong bill, things ordered and not served, lots of waiters but waiting a lot...). But there are a lot of hotel around, therefore you can go eat somewhere else if you want. Good Room, Excellent Service (my son got sick and the staff was extremely helpfull). There is a free shuttle that drop you to the T2/T3 terminal (15min journey). Breakfast from 5.00am, Good breakkie buffet. Good WiFi. Poor service at the restaurant! Poor menu, need a more “standard “menu for travelers.